Remote support technology, including remote control, desktop sharing, and web collaboration, is one of the most popular platforms used across TSIA service disciplines. Today’s remote support solutions offer much more than just remote control for PCs, their functional footprint is expanding to include support for more devices and richer analytics for trend analysis and supervisor dashboards. Service executives should acquaint themselves with the new features and capabilities being introduced by leading remote support platforms and find ways to leverage the capabilities beyond technical support. Field services, education services, professional services, and managed services are all increasing adoption of these tools to boost productivity and avoid on-site visits. 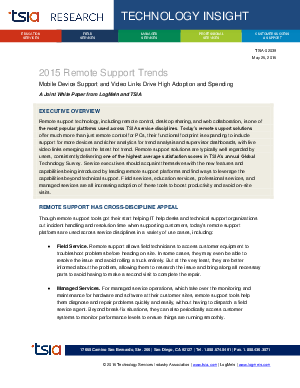 Download this paper to understand the 2015 remote support trends and the solutions available from LogMeIn Rescue.